Hootsuite launched a beta of a new Bulk Message Uploader as an effort to eliminate any extra friction that comes from individual uploads. To gauge the temperature of users trying out the new uploader, Hootsuite gives an NPS survey if a user has opted to return to the old version. The timing here is ideal. 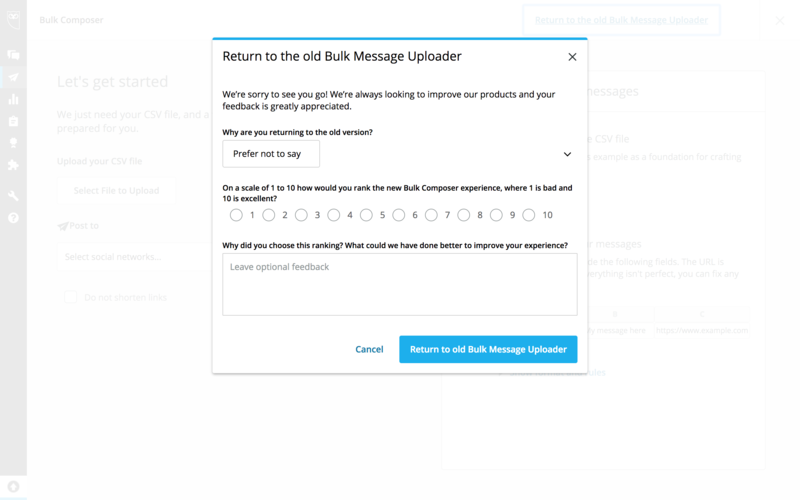 Upon clicking to return to the old Bulk Message Uploader, users are prompted with an NPS survey asking them why. Chances are high that the reason is specific, and users in the moment can explain their choice. The copy of the NPS modal is concise and genuine. Hootsuite apologizes for any inconvenience, states they want to improve, and politely asks for the reason a user prefers the old version. Loyal users will want to help Hootsuite out with their feedback so that the product can be improved.